I just thought I would add You can also make a capacitor work like a pot too with a similar circuit. First you use a simple capacitance to voltage converter. All you do then is control the fet switch with a window comparator that turns it on at 3 volts and off at 6 volts. Of course you need a good regulator on the comparator. I finally got time to add the circuit. It's really crude but this is how I design most of my off the wall circuits. It's doesn't say but the op-amp runs on 10 volts and the hall senors run on 5V regulated. OK, take your time! But I am still interested how you did it. Do You know what Harry has been doing these days I haven't talked with him for a long time now. Well, I don't know the details, but I saw he had his house for sale. I agree Harry has helped me a lot over the years and I really love talking to him. Sorry I didn't get that drawing posted I will get it soon. I got busy and forgot about it and it's still in my scanner. You have helped me a lot on a few projects too. I build a lot but not always on radio circuits and before I came here I couldn't build a radio that worked or even get an oscillator to run. I just built a one 45 minuet timer with a LM358 op-amp that draws only .65 mil-amps. It monitors the led on my tank-less water heater because a had a broken water pipe that I didn't find soon enough. I am always interested to see clever solutions. You can always learn from somebody else! Personally I think it is a pity that Harry doesn't have time to join us more often on this forum. He is one of the people who shares his clever ideas with the world. Harry is a real master in creating circuits with a minimum component count and maximum result! I will post it in a few days. It's just kind of scribbled down on some scratch paper but it does show it pretty well. It originally used a transistor to switch but I had to change that to a J-fet as it didn't work right. I did this a while back with a simple foil circle split in two with a half circle rotor and an IR switch. It worked basically the same except that no inverter was needed.. One side of the circle had a capacitor equal to the capacitance of the first half across it. OK, let's see the schematic! It doesn't look like anyone here is interested in doing anything like this but just in case I did design a circuit to do it and I can post it. I used a single LM324 op-amp and a jfet switch. I used one inverted and one non-inverted and switched them at 0 and 180 degrees. The last 2 were used as a comparator and a current follower. I get 0 to 5 volts out making up the complete circle. I did this because I wanted something that could be completely sealed from the weather and the moisture effects all other types of sensors.
. Something similar could be done here I think. I want to do this so I can completely isolate it from moisture. it is possible to approximate nonlinear functions using an opamp with a diode-resistor network in its feedback. I am afraid it would be harder than the look-up-table technique, though. I have done this in C++ and basic programming a lot with sin and cos but I was looking for a way to do it with out using a micro-controller or A/D's or anything like that. I keep thinking that if I use an op-amp for the output and then use the other controlling it's gain from the quadrature hall sensor. I thought this should get me close enough as using analogue meter won't be extremely accurate anyway. With the magnets I am using I get 2.36 to 1.76 volts with the center at 2 volts. So I will also have to amplify it and we are also dealing with negative numbers making it pretty hard math. As far as the abrupt switch from 359 to 1, this is what I want and expect. from the maths point of view, one cannot obtain a linear function of x by adding, subtracting and multiplying sin(x) and cos(x). It is necessary to implement the arcsin/arccos function and some quadrant logic. The resulting function will have a sharp step (i.e. singularity) when crossing from 359 deg to 0 (resp. 360) deg. and vice versa. Using two A/D converters for both components, yielding the lower and the upper part of address into a memory used as a look-up table seems to be a reasonable method. I wrote this thread quite a while ago but I still haven't started this project and would like to know if I can just connect one hall sensor to the non-inverting side of an op amp and the other to the inverting and get a response showing rotation of direction. If that won't work Maybe you have some suggestions as this schematic doesn't say how to do that. If I can come up with any voltage that is linear I can adjust to what I need. 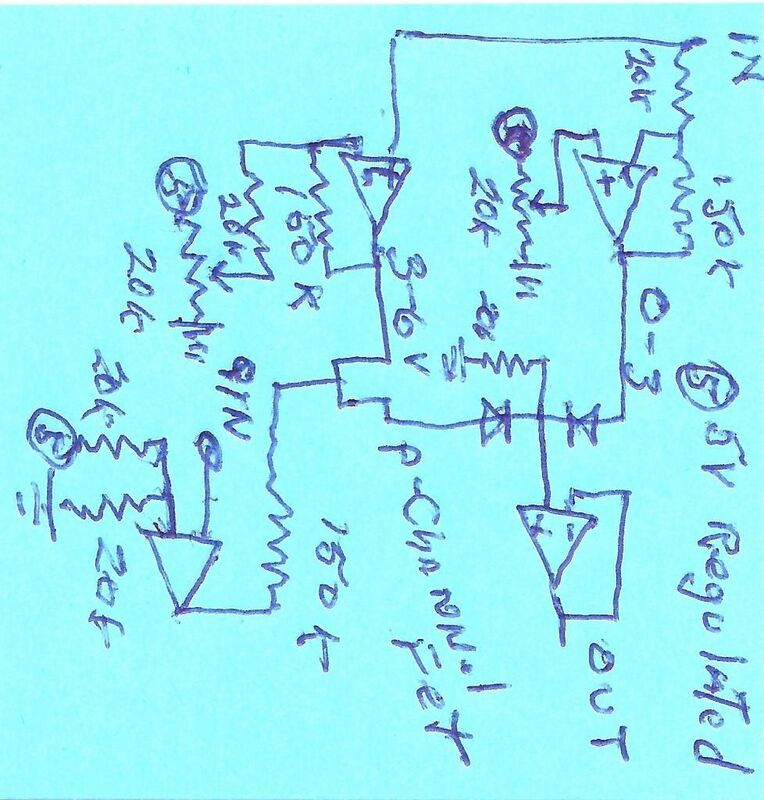 Here is exactly what I have in my book but it doesn't tell me how to connect the op-amps to get 0 to 10 volts or 0 to 5v from the op-amps that I can use to drive a meter with a linear scale. I don't know if I can explain this or not but I will try and I can post a picture with a little more info if not. I have 2 hall sensors mounted at 90 degrees with a horseshoe magnet rotating around them. This gives me two ac signals with one at a 90 degree lag. What I want to do is create a voltage from two op-amps that will be 0 to 5V and linear with 0 to 360 degrees that I can use to drive a MA analogue meter. I don't know how to mix the op-amp voltage to a single voltage that will co-inside with degrees.